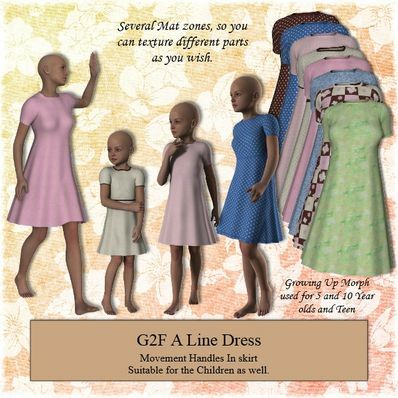 A Line Dress for Genesis 2 Female for use in Daz Studio 4.6. Movement Handles in Skirt. Also suitable for Children. Many thanks! Children clothes are hard to come by.Nice clean lines. Thx a lot, exactly what I was loooking fore! You are a wonderful designer! Thank you! Thank you for sharing this beautiful dress. I'm so glad you added the children in it too. Wonderful dress! Thank you very much. This is a lovely dress and much needed for scenes in an earlier milieu setting. Yet another winner, thank you! Thank you, brings back many memories. Thank you... I've been wanting a simple dress for a little girl. This is perfect! Thank you so much, perfect for everyone and super nice for the kids. Thank you for the movement handles in the skirt and all the various textures. Wonderful work! You are so generous!! Thank you - it is beautiful and useful! I'd Love to see a good old-fashioned gymslip.